If you are reading this post based on the title then you know I’ve completed the first step, acceptance! Stack #5 — In the garage for oil clean up. Typically they were gifted Sons of Anarchy (SOA) tee’s! I’m no longer in denial, and have finally accepted that I have a propensity to purchase too many motorcycle t-shirts. I’ve got several shelves and drawers in a dresser dedicated to everything from tank tops to long sleeve t-shirts. I’m definitely flirting with excessive and now realize after my day of cleaning that I should just say no! I could hit the road and wear each shirt and never do laundry for well over a month. I can promise you that nearly any time I go somewhere on the motorcycle, I’m buying a t-shirt there. Why? Because it’s what I like to wear. But, it also starts out as some regret because when I’m at a motorcycle event and I see a t-shirt that is out of the ordinary I’ll think about purchasing it. It’s unique. It’s a color of black that I don’t own! The graphic design is interesting. The compulsion is to buy the t-shirt, hope for a good fit after being washed and then add the particular t-shirt to my ever growing collection. You just don’t understand the extra ordinary strength it takes for me to not buy a t-shirt these days. In many instances t-shirts have been the only documentation of my rides, a recap of the journey or a memory on one of those bucket list highways. You may think that it gets better with time, and that as I get older I wouldn’t feel the compulsion to have so many H-D t-shirts, but I am here to tell you that in fact it does not. I’ve decided I have give up fighting it, and will now spend more time parting with the worn t-shirts by dropping them off at Goodwill or using some for doing a wax and shine on the bike. Hopefully I’m making a fellow t-shirt “addict” a happier person. The World’s Fair came to Spokane in 1974. Forty years later the first tri-state Pacific Northwest HOG rally came to town and is now in the books! Several of us rode up and took part in the event along with over 1600 other attendees plus a mix of locals and volunteers. 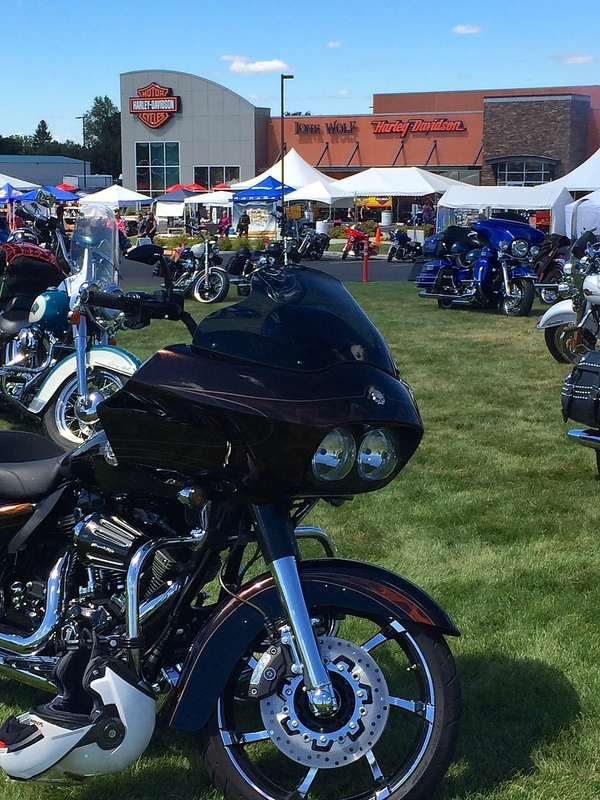 Lone Wolf Harley-Davidson hosted the PNW HOG Rally at its 11-acre complex. The rally had good music, food, refreshments and local vendors from the biking community. At one point there were over a 1,000 motorcycles parked on the grass in front of Lone Wolf H-D to enjoy the festivities. Thanks to Lone Wolf Harley-Davidson for being a great host. Kudos to J.T. Hasley (H.O.G. Events Manager) and Bob Klein (Harley-Davidson) for supporting. Terrific job on the printed maps and rides that made it safe and fun. As a company sponsored riding club how can I not thank Harley-Davidson and Harley Owners Group for bringing it all together. Lastly, a sincere thanks to the many volunteers who made us all feel welcome and put in some long hot days to make the event a success. A few of us stopped in at Cruisers on the state line where many roads lead there and one that goes right through the joint. I’m not sure if my hearing will recover from either the band or the deafening loud pipes as folks motored through. When: Thur. July 10 – Sat. July 12th. Pendleton, OR is where the annual Rodeo and Round-up happen. It’s a cowboy town and on Thursday, July 10th the Harley rally, shall we say “gallops” into town? There’s a lot to see, from the Underground Tours to brothels of yesteryear – a lot of history. Then on Friday it’s head-out West toward the Cascades and over Mt. Hood to The Resort at The Mountain. At this destination you can throw down a bedroll and do the camping gig or wander over to the Resort for premium resort activity. This location also serves as a secondary registration for the riders who couldn’t get extra days off work and want to start the rally at Mt. Hood. On Saturday it’s looking for Ocean spray along the coast to Seaside. Riders can bask in all that the beach has to offer from boardwalk and Bike Fest vendors to Crab Cakes. On Saturday night there is a concert and closing ceremonies. Sunday morning is open and you can stay and enjoy Bike Fest or take a ride down the Oregon coast. Whatever – you chose. The overall schedule is HERE. To register call 503.640.2369 or email at ORStateRally@Sunsethog.com Registration is open until May 22, 2008. The H.O.G. event is Thursday, August 28th and includes a night of music and celebration with Aerosmith and Kid Rock. There is FREE admission to CLUB H.O.G 25 (the 25th Annual H.O.G. Rally) at the Miller Park exterior grounds (one guest per member). Just show your H.O.G. card and walk in. But, you’ll need to purchase tickets for the music portion of the event. In keeping it so simple that even I can understand, the theme is the 25th anniversary so, concert tickets are just $25. There are 40,000 seats available and will go on sale March 12th at 8AM CST. Set your timer if you plan to go.